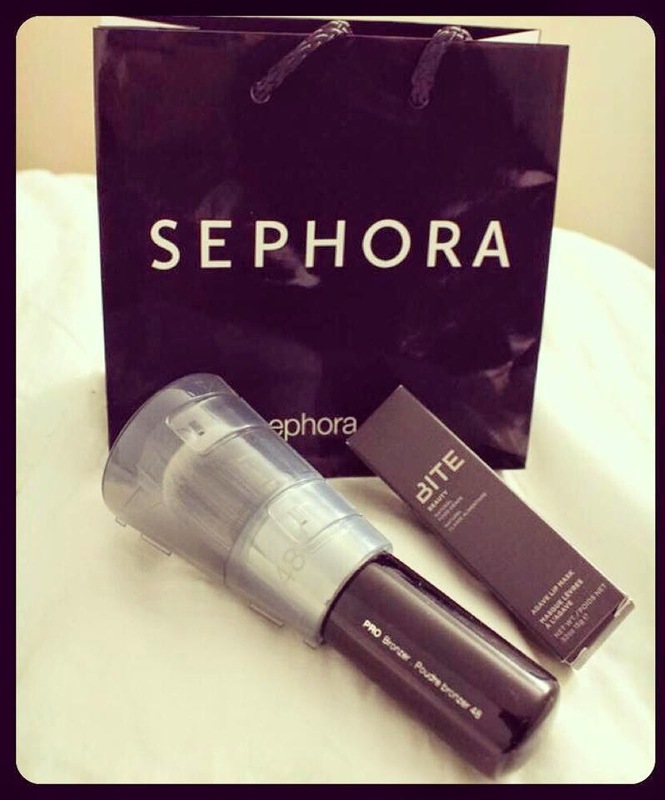 Sephora Chic Week Sale (15% off everything) is still on till April 11th. Click here to read more about the sale and coupon codes. I made my fourth and hopefully last visit to Sephora today. 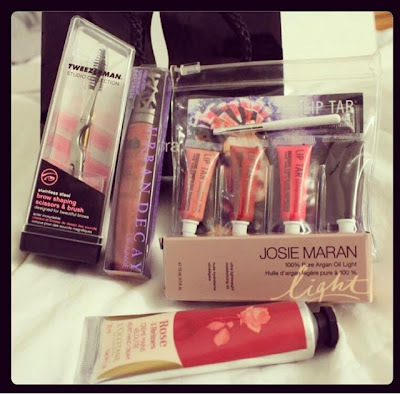 I'm not planning on going back to Sephora for awhile.. a GOOD while! lol I wanted to try out few of these products for some time now but I was just waiting for the sale. Too Faced Melted Liquified Long Wear Lipstick Melted Violet 0.4 oz : I really want this! I personally love all the colors! I couldn't find it in stores, so I might end up ordering it online. UPDATE: I ended up finding it during last days of the sale. Click here to read my full review. 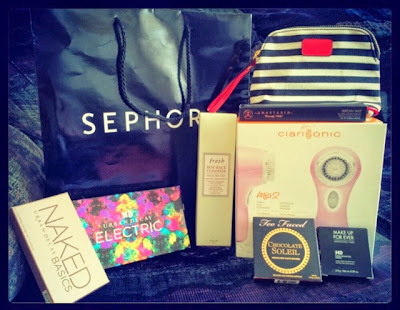 I went to Sephora (Dix 30 store) in the afternoon and bought most of the items on my list. One of the sales associates helped me find all the items on my list (well most). She was very nice and I'm happy she helped me out with everything. 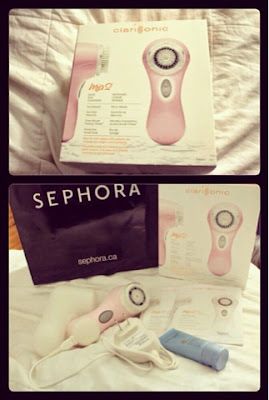 The first item I picked up was Clarisonic Mia2(TM) Skin Cleansing System Pink . Click here to read more information and my first impression on it. The sales associate also recommended Fresh Soy Face Cleanser. I had also read online reviews about it and I heard it's a great cleanser, so I decided to try it out. I'm very sensitive to smells and initially I hated the smell but after the second use it didn't bother me so much. Urban Decay Electric Pressed Pigment Palette: This is Urban Decay's new palette. It comes with a variety of 10 shades of eye shadows and a double ended brush. The shades are so vibrant! I actually used Thrash few days ago, which is bright metallic teal. It lasted me throughout the day! 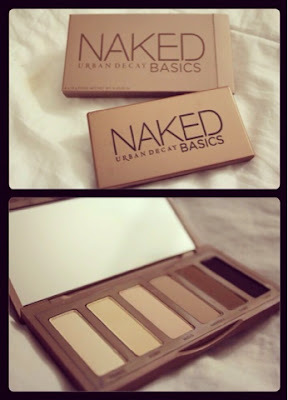 Urban Decay Naked Basics Palette: I'm happy I got this palette. It has basic colors that can be used to highlight or give definition to the crease. I really wanted matte colors to go with my Naked 2 palette and this is just perfect. I used Crave few days ago to create a smokey look with the Electric Pressed Pigment Palette (Shade Thrash). 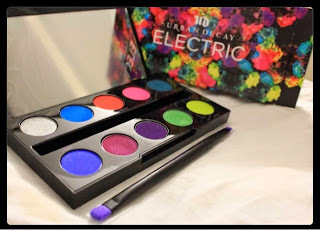 Just like the other Urban Decay palettes I've tried, the eyeshadows are long lasting and pigmented. 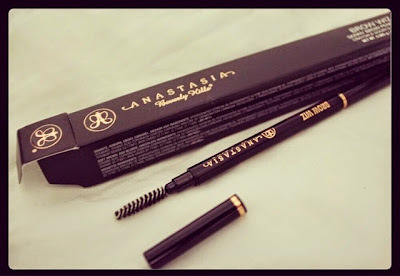 Anastasia Beverly Hills Brow Wiz (Color Dark Brown): So far I've used it once and I liked it! It's very easy to use and eyebrows look natural. 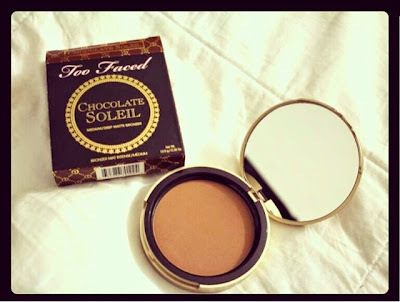 Too Faced Chocolate Soleil Medium/Dark Matte Bronzer: It's rated 4.7 stars on Sephora's website and many reviewers mentioned that it's natural looking, so I wanted to give it a try. I haven't used it yet. 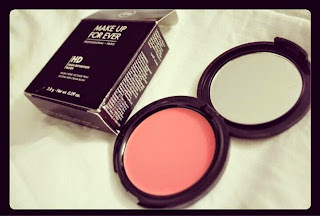 Make Up For Ever HD Blush (color 210 - cool pink): This is the first cream blush that I bought, so I am excited to use it. It's rated 4.8 stars on Sephora's website. I like cream products because they are very blendable. I can't wait to try this. 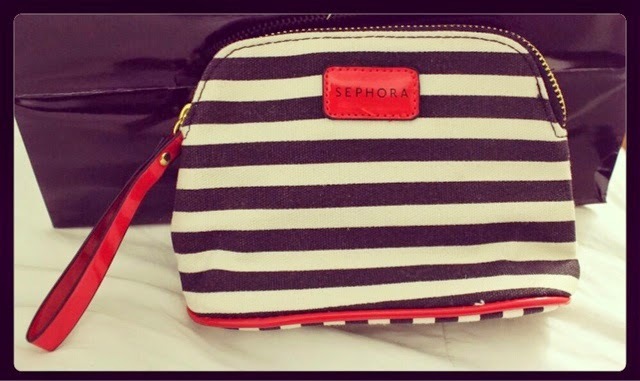 Since it was the Early Access Event, they were giving out free striped cosmetic bag to VIB members. It's so cute. I love it! I didn't have to show my email or anything. I just showed my VIB card to get the cosmetic bag along with the 15% off everything. 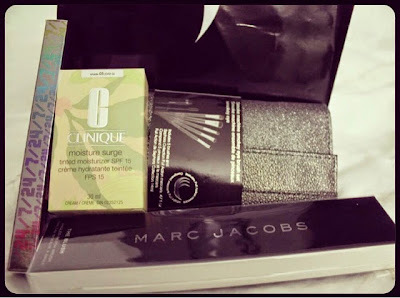 I forgot to buy few stuff on Thursday, so I went back on Friday evening to Sephora (Quartier Dix 30) with my best friend. 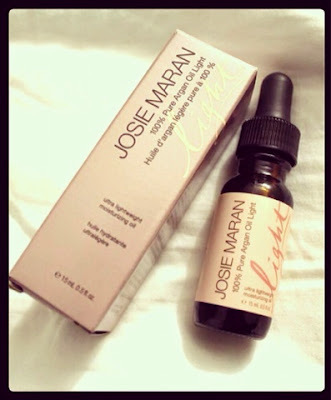 Josie Maran 100 percent Pure Argan Oil Light: I read many positive reviews about this. I've been using this for past few days at night time before going to bed. I found it a little greasy, so wouldn't use it during day time. 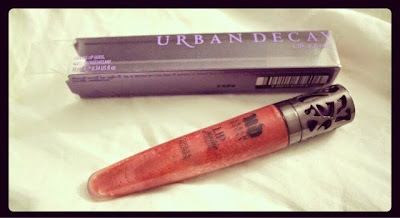 Urban Decay Lip Junkie Lipgloss (Naked): I love this lipgloss! I got a sample with my Naked 2 palette and it was finishing up, so I purchased the full size. I went to Fairview (Pointe-Claire) and decided to pass by at Sephora because I had forgotten to buy Urban Decay Super-Saturated High Gloss Lip Color (color Lovechild - pale pink) for my cousin. I have the same and my cousin really liked it, so I decided to get it for her. It's very hydrating. I also wanted to look through their tinted moisturizers. I initially wanted to get Tarte Amazonian Clay Tinted Moisturizer (Medium Tan) but the one that I saw in store didn't have SPF, so I asked a sales associate and this is what she suggested Clinique Moisture Surge Tinted Moisturizer SPF 15. She said this was lightweight and looked more natural. She also helped me find my shade. 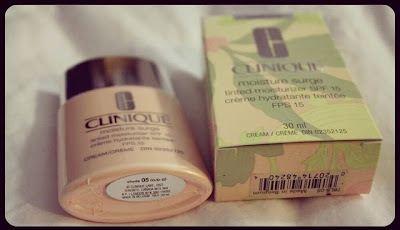 Clinique Moisture Surge Tinted Moisturizer SPF 15 (Shade 05): You can definitely smell the sunscreen. I only tried it once after purchasing it and found that it was a little darker than my skin tone. My friends said they didn't really notice it but I just wasn't in love with it. However, I'm going to give it a second try and hopefully find ways to make it work. Urban Decay 24/7 Glide-On Eye Pencil: I really like this eyeliner but I only used it once. I like how it goes on so smoothly and it stayed throughout the day. Marc Jacobs Beauty The Blush - Angled Blush Brush No. 10 : I've read many positive reviews of Marc Jacobs Beauty Brushes. I was looking for a blush brush, so decided to try this one out. It's a good brush but you can find cheaper brushes that get the same job done. Nonetheless, their Bronzer Brush is definitely on my wishlist but I will wait and get it during their Holiday Sale. 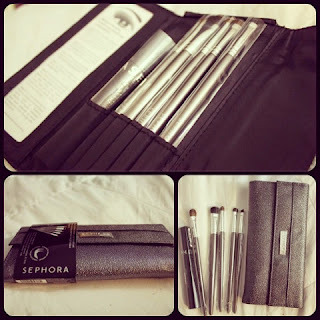 Sephora Collection Smoke Machine Smokey Eye Brush Set: For the price, this brush set is worth it. I tried all their brushes but didn't try the mascara yet. 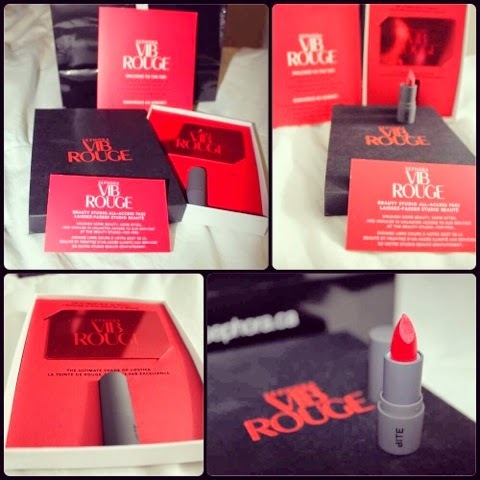 And finally I got my VIB Rouge Welcome Kit. Click here to read more about it. When I got home, I found the Tarte Amazonian Clay Tinted Moisturizer. I didn't realize I put it in my basket and paid for it (I honestly don't know where my mind was lol). 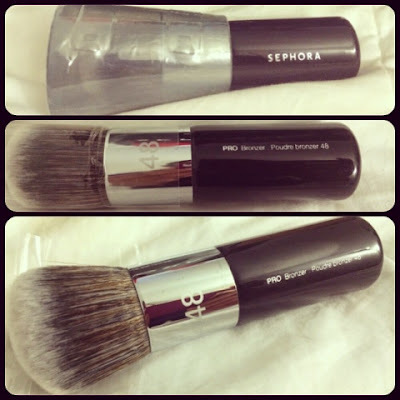 So I decided to return it..
SEPHORA COLLECTION Pro Bronzer Brush #48 : I like how fluffy and soft this brush is. 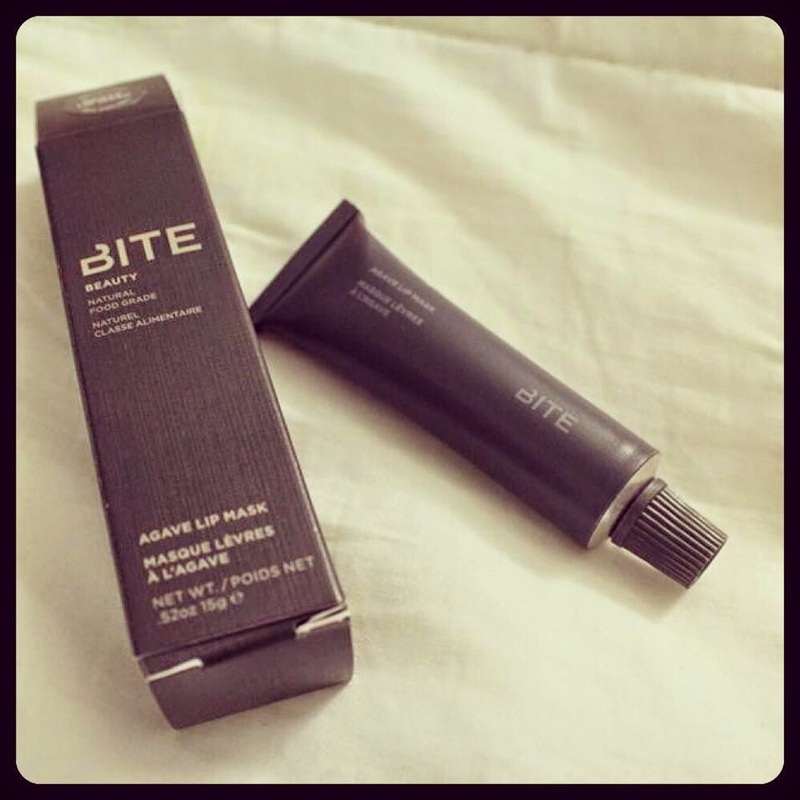 Bite Beauty Agave Lip Mask: I read many positive reviews about this so decided to try because my lips are always dry. I actually did try it out and found it very hydrating! So far I really like it! 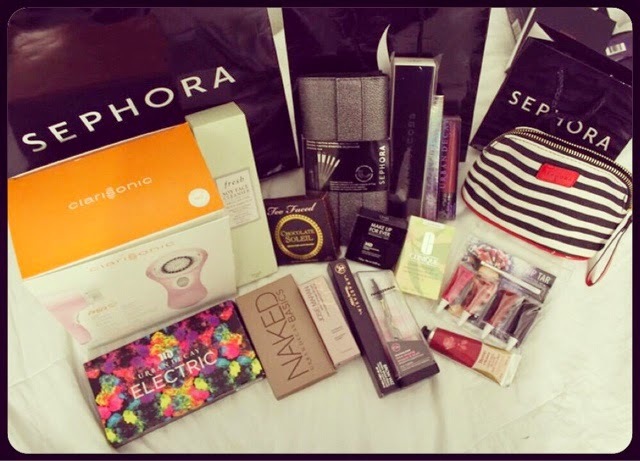 I'm not planning on going to Sephora for awhile. I can't believe I've spent this much! I'm happy with my purchases though. 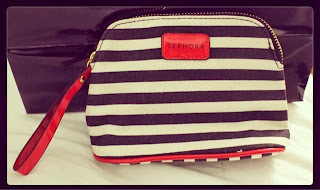 However, I'm not going to Sephora for awhile.